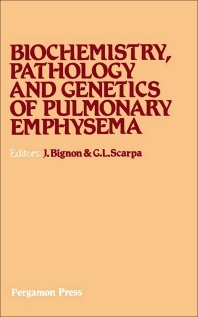 Biochemistry, Pathology and Genetics of Pulmonary Emphysema documents the proceedings of an international symposium held in Sassari, Italy, 27-30 April 1980. Research on the origins of emphysema has acquired more importance than functional diagnostic studies. There are various hypotheses concerning the development of emphysema. Some cases of emphysema are linked to defects in metabolic functions of the vessels while others are linked to a disturbance in repair processes. The papers in this volume are organized into four sections. Section 1 contains studies on the pathology and biochemistry of lung connective tissue. Section 2 deals with animal models. Section 3 on proteases and antiproteases includes studies on the characteristics and identification of biological specimens, and alpha1-proteinase inhibitor. Section 4 takes up the risk factors and therapeutic approaches for lung disease. Other papers in the volume were presented during two roundtable discussions on the biochemistry of connective tissue components in emphysema and therapeutic approaches.